5,5,4 - 4..........Chico von Forell. 5 - 4,5.............Odin von Forell. 4,5 - 4,5..........Bonni von Forell. 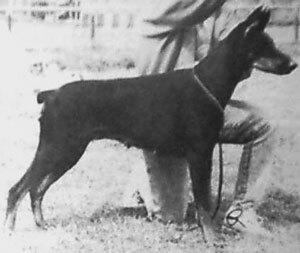 Papin Amatzon: IPO 3, HK 3, JK 3 and Finnish 'All Breeds' Working Champion in 1992. He is sire of Doberwache's “A” litter (Amatzon, Afra, Alfa, Anke).